This is an easy midweek supper dish that can be made from start to finish in only 30 minutes. Bacon is quick to cook and packed with flavour. Heat the oil in a large frying pan and cook the potatoes over a low heat for 10-15 minutes, turning occasionally. Add the garlic and bacon and increase the heat. Fry for 5-6 minutes, tossing occasionally, until the potatoes and bacon are golden. Add the onions and cook for 1 minute. Stir in the mustard and plenty of salt and pepper. Divide between four plates and keep warm. Half fill a small frying pan with water and bring to a simmer. Carefully break in the eggs and allow the water to come back to the boil. Simmer for 1 minute, then remove each egg using a slotted spoon. 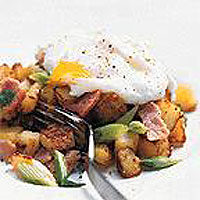 Top each plate of hash with a poached egg, sprinkle with black pepper and serve immediately. It is easier to cut up bacon using scissors instead of a knife.